Actually our subjects totaled 11, and they were rats versus mice. Their task was to navigate that typical maze that scientists are known to design for these types of research studies. However the challenge for this particular group of rodents was to run the entire course blind. 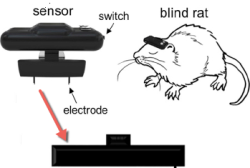 That’s right, researchers at the University of Tokyo actually attached geomagnetic sensors with a compass to the rats’ brains who had their eyes sutured shut. Then when they moved their heads, the sensor generated electrical impulses to prompt them as to which direction they were facing. Neurosci Yuji Ikegayaentist Yuji Ikegaya and pharmacologist Hiroaki Norimoto wanted to know if this geomagnetic signal could actually substitute for lost sight. So, as the electrodes sent electrical pulses to the rats’ neurons, the scientists let the ‘bionic’ rats loose in a maze with treats at the far end to act as an incentive. The maze shaped like a T always positioned the tasty treat in the branch that faced east--so depending on the rotation of the maze, the rats would sometimes have to turn left to find the treat, and sometimes right. Blind rats without the digital implants never achieved more than a 50 percent chance of guessing the correct branch. By comparison, the bionic rats managed to find their way around nearly as well as the sighted rats. By their fourth day of training, bionic rats chose the correct branch 82 percent of the time, and by Day 9 their success was a whopping 90 percent. Similar results held when the researchers involved the rats in a more complicated, five-armed maze. Even after the researchers turned off the signals from the digital compasses, the bionic rats managed to find their way around, indicating they had used the compass to form a sort of mental map of the maze. Extrapolating this research for humans, it was determined that this technology one day would be able to help blind humans to independently navigate their surroundings. “The most plausible application is to attach a geomagnetic sensor to a cane, so that the blind can know the direction via tactile signals such as vibration,” Ikegaya wrote in an email. 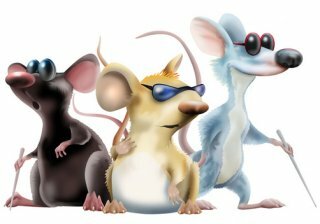 So that’s the story of our bionic blind rats. Do you think we can rework that old nursery rhyme to bring it up to date for our 21st Century toddlers to learn? They’d never find the treats of their life. (Nonetheless) they proved that while blind as bats. They were eleven ‘super’ blind, bionic rats!